Own Your Very Own Pac-Man Arcade Cabinet | OhGizmo! By Chris Scott Barr on 11/12/08 • Leave a comment! 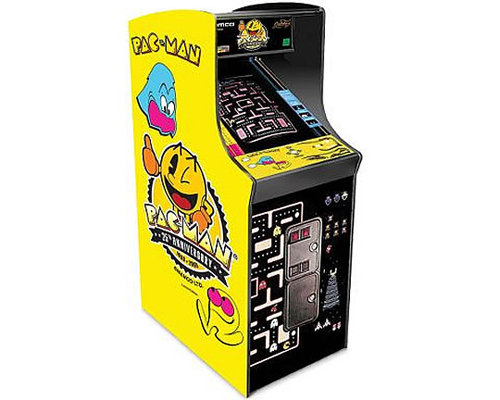 If one of your childhood dreams was to own your very own Pac-Man arcade cabinet, then you’ll be happy to hear that Namco has re-released one of their most popular cabinets. This full-sized arcade unit stays true to the original design, with only a few changes, one of which is a new 25th anniversary logo on the side. The cabinet stands 58-inches tall, and weighs close to a ton. (So it’s actually only 237lbs, but have you ever tried to move one of those things? Not fun.) As a bonus, you’ll not only get the original Pac-Man, but also Speedy Pac-Man, Ms. Pac-Man and Rapid Fire Galaga. Unfortunately this piece of gaming history is going to set you back $3000. Personally, I’d rather find an original one in decent shape, rather than purchasing one of these brand new.